The Galaxy Note 5 and galaxy S6 Edge Plus are the two hottest smartphones for which Sammy fans and also, people who are looking to get their hands on high end phablets are waiting for. And as the next Unpacked event comes near, more and more rumors and leaks surface on the web. Right now, we have got some great leak regarding the Galaxy Note 5 and Galaxy S6 Edge Plus. Earlier, @evleaks had hinted about the specs of the Galaxy Note 5. Moving on to the Galaxy S6 Edge Plus, the Galaxy S6 Edge Plus is quite similar to galaxy Note 5 in terms of specs, but looks different with its dual edge. The device will have a 5.5-inches 2K display and pixel density of 534 ppi. 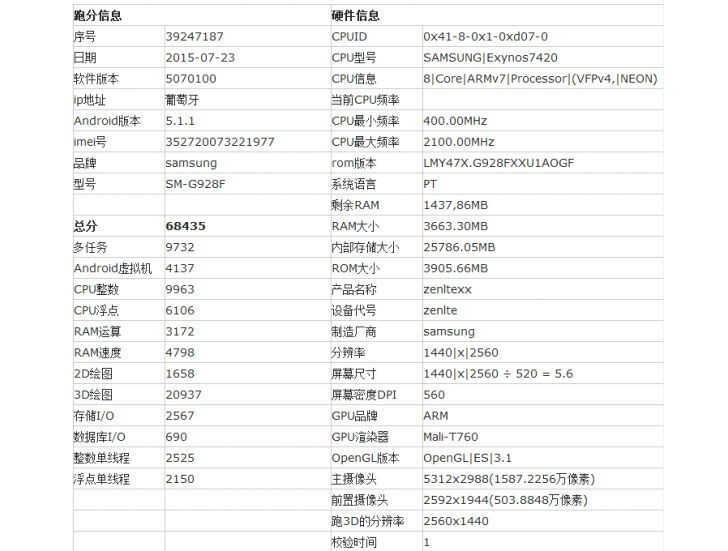 There will be Exynos 7420 SoC on board, coupled with 4GB of RAM. The rest of the specs are quite similar to Galaxy Note 5 with Mali-T760 GPU, 16MP and 5MP snappers. 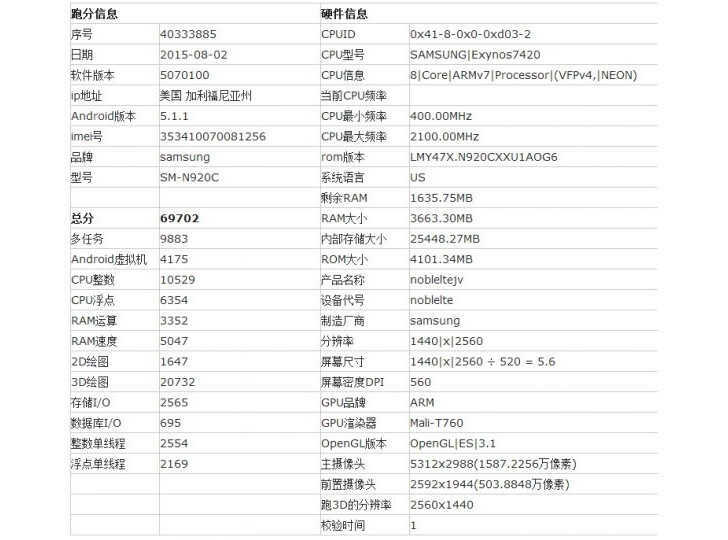 This is the specs sheet leaked for Galaxy S6 Edge Plus. The Galaxy Note 5 has a top score of 69,702 and the S6 Edge Plus could score 68,345, whereas the S6 and S6 Edge have 67,520 and 63,910, respectively. There is no certainity that these specs will be exactly the same when these devices are shipped. 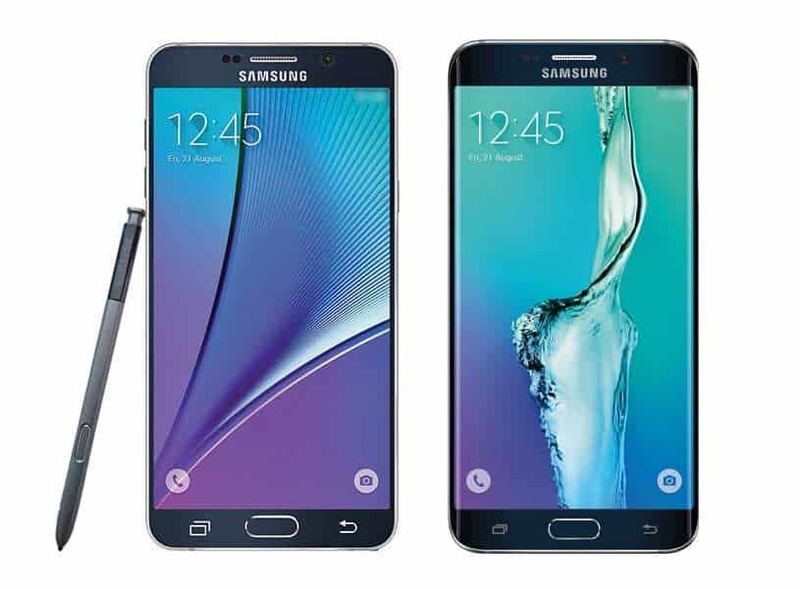 However, we can now expect better and faster Note 5 and Galaxy S6 Edge Plus. Previous articleOnePlus 2 First Sale: 30K Units Sold Out in 64 Seconds !